Kapingamarangi Bible shipped to Pohnpei! 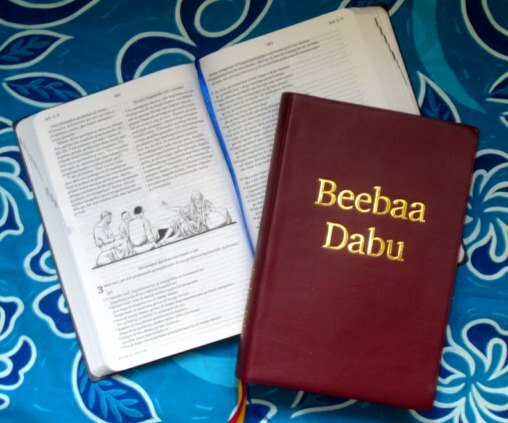 (September 9, 2014) Last week Nico Daams, the consultant for the Kapingamarangi project, received the first two copies of the newly printed Bibles from the New Life Printers in Sri Lanka. They are beautiful! We expect the Bible to arrive in Pohnpei in the next month or so, and have set the time for the dedication for December. Exactly when will depend on the shipping schedule that will take the Bibles and the guests from Pohnpei to the Kapingamarangi atoll.